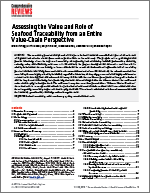 The Global Food Traceability Center (GFTC) recently released a report outlining results of a study which explored the impact of traceability on improving seafood industry business performance, including reducing waste, and enhancing consumer trust. To download the report, please tell us just a little about yourself by filling out the adjacent form. By completing the form, we can continue to update you on resources and tools developed by the GFTC.